Flexible and versatile barcode label maker software specially designed for healthcare industries and hospitals for designing and creating barcode image with option to modify various image setting in simplest and affordable way. Barcode generator has technically advanced features including image setting tools, color setting tools that are capable for design and print labels, tags and stickers in different shapes and sizes in various font styles. Company provides a free download trial version of the program that is helpful to simply understand the features and functionality of the software before ordering complete program. Utility uses graphical user interface environment that is helpful to operate the program by any category of user without any experts’ help and technical skills. Easy to download healthcare barcode label maker software quickly design barcode label in supportive 2D barcode and linear font standards. Technically advanced barcode label maker software is a smart and affordable solution to create and design high resolution healthcare barcode, price tags for medical products, tool and medicines in cost effective manner. 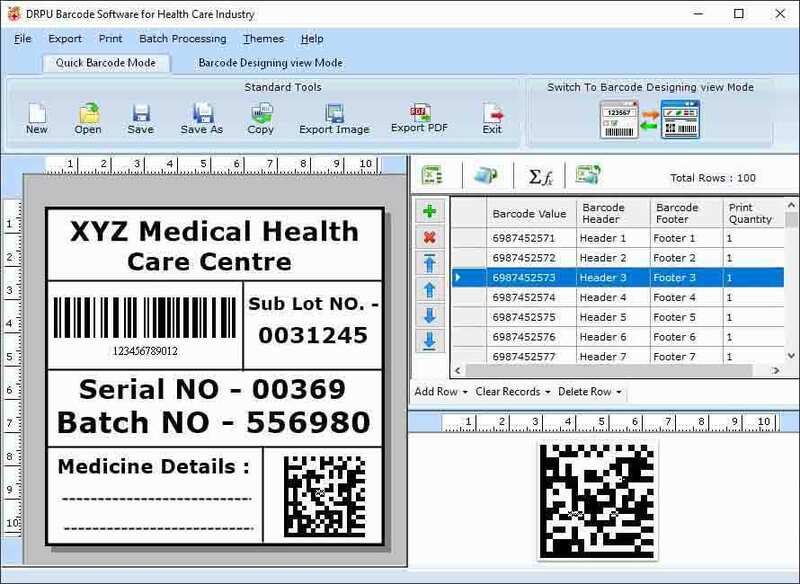 Hospital barcode maker software allows the user to print multiple copies of same barcode labels and tags in single paper at same time. Extraordinary features: * Healthcare barcode label maker software is a reliable solution to design barcode labels in easiest manner. * Software uses graphical user interface environment that is helpful for any kind of user to easily operate the utility. * Utility has advanced features that are capable for designing barcode labels in different shapes like rectangle and ellipse etc. * Software enables the user to design barcode labels in 2D or linear font style. * There is no need of any experts’ help to operate the utility. * Software enables the user to save barcode image on your pc that can be used later when required.